40th Annual Celebration is 8/18/2018. Save the date today! 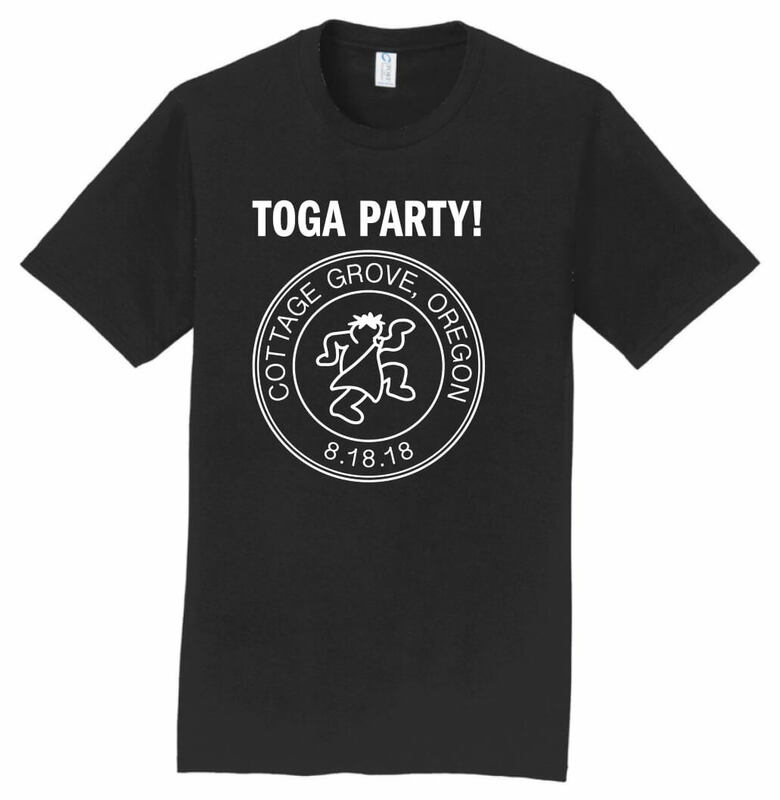 At HIGH NOON, the Party begins with a Toga Parade down Main Street – the original route in the Animal House film. 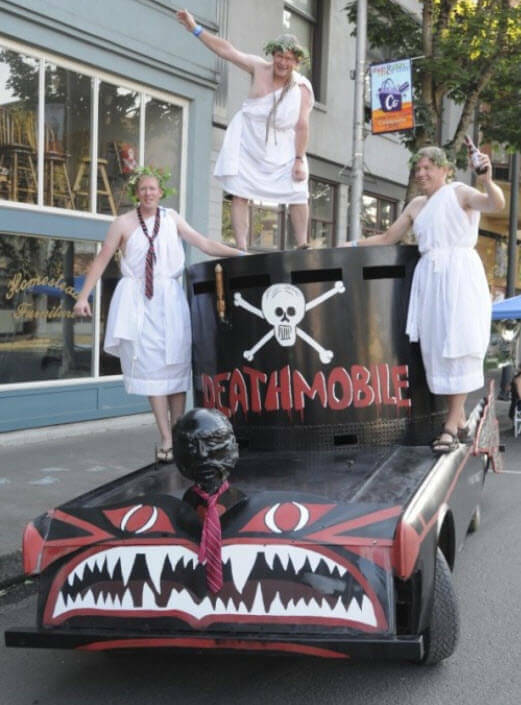 The parade will include the Deathmobile, marching bands, firetrucks, horses, some of the Animal House cast and crew, and people in togas, togas, and more togas! Yes, it most definitely will be a laughing matter. 5 PM, the Beer, Wine and Food Garden opens in Bohemia Park, which is centrally located in Cottage Grove at Main and 10th Streets. Eat, drink and be merry. 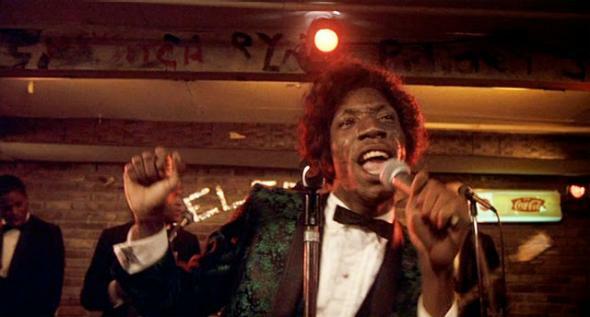 7 PM, the Music Concert begins, featuring Animal House celebrities such as Otis Day, The Kingsmen; The Cry! and the Original Knights. *Toga attire is NOT required for entrance to the party but white toga attire IS required to comply with Guinness World Record Rules. In otherwords, if you want to be a part of the world record count you must be in a white toga. After the parade, there will be FREE showings of the wildly successful Animal House (PG version). The showing will also include the newly completed documentary, Animal House of Blues, which had one of the highest rating when shown on PBS. The FREE showings are sponsored by the Eugene International Film Festival and will take place at the Cottage Grove Armory. There will be limited seating. Beginning Friday, August 17, and going through Sunday, August 19, the Film Festival will screen over 50 juried films; national and international, shorts and feature-length. There have been more than 170 film submissions from over 25 countries. The films screened at the festival will be in seven categories: Adventure-Drama-Mystery, Animation, Documentary, Narrative, Pacific Northwest, Sci-Fi, and Spirituality. A $3,000 GRAND PRIZE will be given to the Best Film. Here is where you can find more information. Friday Night Party at the Village Green Resort, which will feature an outdoor screening of Animal House (R-rated version). Alcohol will be served. Must be 21 to attend. Email or call (541) 942-2491 for more information. A Saturday morning short run/walk from Cottage Grove High School to the Historic Downtown. Email or call (541) 942-2411 for more information. Interest in being a VENDOR? Email Vendor Manager Missy Estep or call (541) 514 -2959. Interest in EVENT SPONSORSHIP? Email or call Len Blackstone at (541) 942-3870. Interest in the PARADE? Email or call Candace Solesbee at (408) 722-8660. 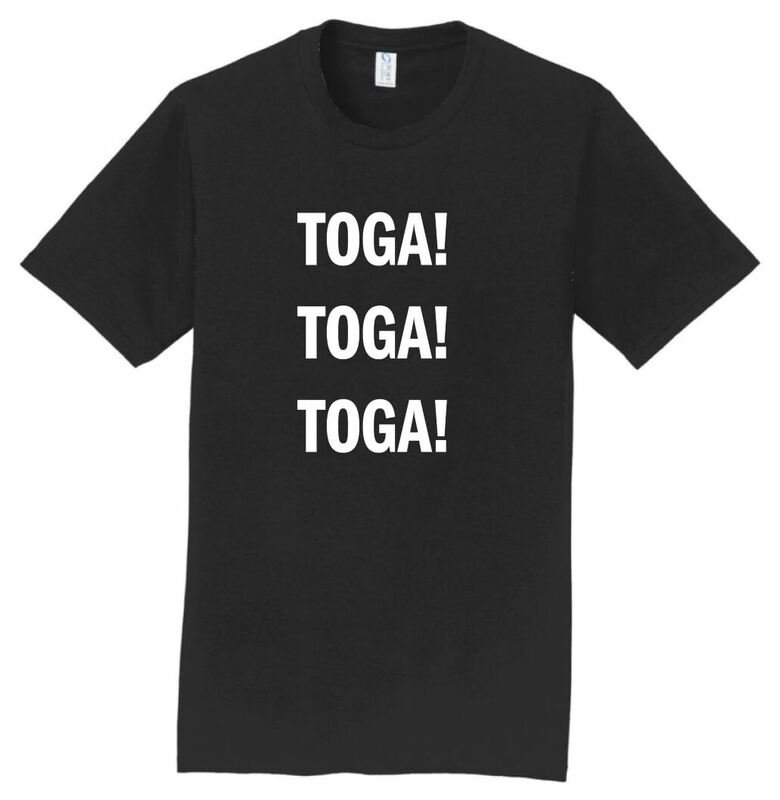 Buy these "TOGA" t-shirts at the Party. The small town of Cottage Grove (pop. 10,000) was a key location in filming the movie, Animal House. We held the record for the world's largest toga party until 2012, when two universities in Brisbane, Australia assembled 3,700. Help us win back the World Record and have a blast at the same time. Cottage Grove is located on I-5 just 20 minutes south of Eugene and the University of Oregon.